I ordered the cutest carseat cover from Carseat Canopy. It is quite adorable and I have heard a couple of complaints that it is not safe for children though I am not sure why, perhaps it is fabric related, but this is for dolls anyways so I am not quite as concerned. I really love the cover it's gorgeous! I used a carseat that was my Granddaughters that she out grew and washed the original padding well. Then I installed the new cover over it. It is really cute! If you want a really great deal on it use this coupon code. I got mine for about $39.95 though it was originally $89.95 for the whole caboodle. What a bargain in my opinion. I feel it is worth the $89 but why pay that??? I didn't. I am not sure how much this coupon is good for. Although I wanted the pink one, I opted for the grey though I might order the pink one later because it's just so darn cute! But they were on back order! But go get yours here www.carseatcanopy.com. Here is the pink one. Backordered through December, bummer. So I ordered a really cute grey one, with a chevron pattern and grey dot plush. I am not getting paid anything to tell you guys about this however if you order they may refund my shipping. I put the coupon code above! It was really easy to install and I am definitely ordering the pink one later. It looks so cute! So here is Kendall Paige in her carseat with the new cover! Yay! It came with the seat cover, the head support pad, the canopy cover, and the mini lap blanket and it also came with the over the top cover. I love it. It fit the slightly larger toddler seat I had and the seat belt holes lined up perfectly. 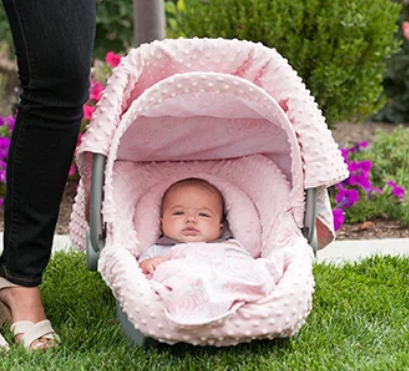 I might buy a smaller car seat and get the pink one with damask flowers. It looks well made to me, definitely looks washable. The plush fabric feels super nice! It's the perfect cover of grey too! Remember Kendall is still available at e-ebay right now. I just reborned her about a week ago so she is still waiting for her new mommy. I have to say, she is so incredibly cute in person and really even though her pictures do not show it, she is full of personality. Sneak Peak of Kendall Paige - Available Now!